One of my favorite supplements for adding a couple pounds of lean muscle quick is Animal Test by Universal Nutrition. I think I’ve gone through about 4 “cans” of Animal Test and every time I’ve seen strength gains almost instantly, and have added about 5 pounds of lean muscle mass in the 21 day period. What is Animal Test? It is a “pro-testosterone” supplement, and is supposed to be the strongest on the market. For those of you new to my blog, I only ever do honest reviews of supplements. I test a ton of different supplements year round and have a good idea of what other products in the same category are like. I’ve taken a few other testosterone boosters (including two another Universal Nutrition products called Animal Stak and Animal M-Stak). Animal Test was definitely the best testosterone booster I’ve taken. 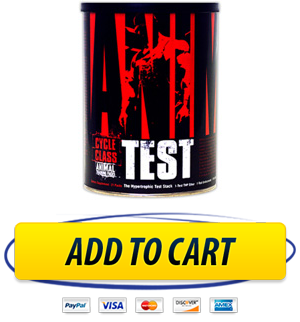 Test boosters are a hard product to gauge how well they are working, because the affects aren’t instant like they may be with a pre workout supplement such as SuperPump Max. With that said I could definitely feel the Animal Test kick in after about just 2 workouts. My muscle felt “fuller” during my workouts, and even just throughout the day (pumps lasted longer too). My strength shot up pretty noticeable after just a couple days too. In about the first week I gained around 3 pounds every time I took Animal Test, and then the last 2 weeks I would gain another 2 or 3 pounds of lean muscle. I am not too sure, but I am pretty sure my hair was growing quicker (and nails too) while taking Animal Test. Maybe it was just in my mind, but either way I think it is pretty common with test boosters and it wasn’t a negative side effect. One thing I did notice was I was a little bit “moodier” than normal sometimes. Aggression might have been up a bit, but it wasn’t a problem at all. Again some of these things might just be in my head after starting Animal Test – I don’t know. Side Effects Review gets a 4/5 – Nothing really negative to report on. It is a must that you buy this online at somewhere trusted like Bodybuilding.com which offers almost 50% off what Animal Test costs in stores. Priced at over $120 in some stores, it is currently listed at $64.49 online at Bodybuilding.com! This is a fair price for the work it does, but if you are really short on cash it isn’t the best choice for you. Animal Test Price Review gets a 3/5 – Pretty pricey, but it is a good supplement. All in all great test booster and if you want to add muscle quick I would try it out… click here to buy Animal Test for cheap. hi , do you have any tips to maximize the results of animal test? eating training? pct? Hey sorry I didn’t see this comment until now Larry.